The BOM History Inquiry window is a “Most Recently Viewed” list for the BOM Entry and BOM View windows. It provides quick access to a previously viewed BOM, making it easy to drill down into lower level assemblies and then quickly return to the top level. It also adds a universal Zoom feature. You can drill into any subassembly by clicking on it in the treeview and pressing CTRL+Z. This will work with any BOM, such as MFG BOM or ENG BOM and also Configured and Archived BOMs. Quickly retrieve a previously viewed BOM by double-clicking on it in the BOM History window, or click BOM Inquiry to open the BOM in the Inquiry window. BOM History Inquiry works with both the BOM Entry and BOM Inquiry windows. BOM History Inquiry also adds a hot-key (CTRL+Z) to zoom to ANY selected subassembly. 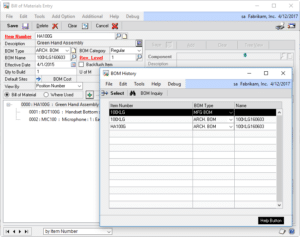 This addresses an issue with the “Select Item” button where it retains the BOM Type and BOM Name from the Parent Item when attempting to zoom to the Component, so that if a MFG BOM Parent contains a subassembly of another BOM Type (i.e. 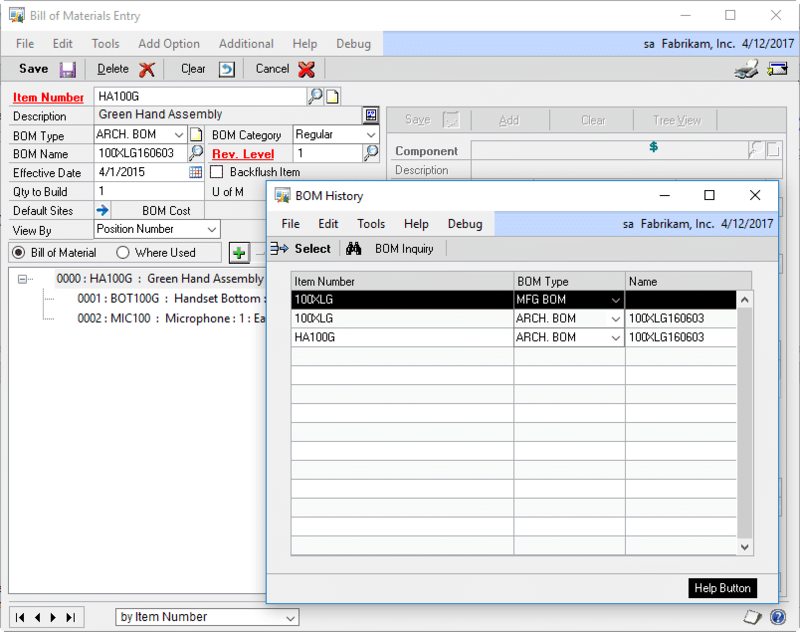 ENG, CONFIG, ARCH), the “Select Items” button will only zoom back to the MFG BOM of the subassembly.